JMA reported that the number of volcanic earthquakes at Satsuma Iwo-jima, a subaerial part of Kikai’s NW caldera rim, was low during 20-26 April. White plumes rose as high as 700 m above the Iwo-dake lava dome; incandescence from the crater had not been visible since 12 April. During field surveys on 25 and 26 April observers noted a slight expansion of a thermally anomalous area compared to 24-25 March observations, and a decrease in sulfur dioxide flux from 600 tons/day on 24 March to 300 tons/day. The Alert Level was reduced to 1 (on a 5-level scale) on 27 April. JMA reported that the number of volcanic earthquakes at Satsuma Iwo-jima, a subaerial part of Kikai’s NW caldera rim, was low during 27 March-2 April after an increase recorded during 22-23 March. White plumes rose as high as 1.8 km above the Iwo-dake lava dome. Incandescence from the crater was visible at night during 27-28 March. The Alert Level remained at 2 (on a 5-level scale). JMA reported that one small-amplitude, short-duration volcanic tremor was detected on 16 March at Satsuma Iwo-jima, a subaerial part of Kikai’s NW caldera rim. The number of volcanic earthquakes increased on 19 March, prompting JMA to raise the Alert Level to 2 (on a 5-level scale), and then decreased the next day. The report noted increased thermal activity since February, with occasional visual observations of incandescence. Based on information from JMA, the Tokyo VAAC reported that on 4 June an ash plume from Kikai drifted W.
Based on information from JMA, the Tokyo VAAC reported that an eruption at Kikai on 25 September at 0937 produced a plume to a height of ~1.5 km a.s.l. that extended W.
Based on information from JMA, the Tokyo VAAC reported that Kikai erupted on 1 June at 1330. The resultant ash cloud rose to an unknown height and drifted W.
Based on information from the Japanese Meteorological Agency, the Tokyo VAAC reported that Kikai erupted on 24 March at 1755 and on 25 March at 0715, producing plumes that reached a height of ~1.5 km a.s.l. and extended S and NW, respectively. No ash was visible on satellite imagery. Based on information from the Japanese Meteorological Agency, the Tokyo VAAC reported that an eruption at Kikai on 5 March at 0922 produced a N-drifting plume to ~1.5 km a.s.l. No ash was detected on satellite imagery. According to JMA's report on 6 June, discolored plumes, associated with volcanic tremor, had intermittently issued from Kikai's summit since 11 May. In addition, the number of small volcanic earthquakes had increased since 29 May. Discolored plumes were observed from Mishima village on the Ryukyu Islands and ash fell on residential areas during 3-5 June. The Air Force Weather Agency reported that low-level plumes were visible on satellite imagery during 1-4 June. The Air Force Weather Agency reported that plumes were visible on satellite imagery emanating from Kikai during 24-28 May. The thin plumes drifted to the S on the 24th, SE on the 25th and 26th, S on the 27th, and E on the 28th. The plumes were estimated to be lower than 3 km a.s.l. Ash was seen from the island of Yaku-shima on 26 May during 1600-1800. After 29 May the area was covered with meteorological clouds, preventing satellite observations. Continuous volcanic tremor was recorded at Satsuma-Iwo-jima during 20 to at least 23 July. A seismometer about 700 m SW of Iwo-dake crater recorded 50-100 earthquakes daily, in comparison to 30-90 earthquakes recorded daily during December 2000 and March 2001. Small amounts of volcanic tremor were also occasionally recorded. The Iwo-jima Branch of the Mishima Village Office reported that ash fell during 19-21 July. Faint ashfall and small volcanic tremor had occurred since December 2000. Gray plumes were ejected to 400-500 m above the summit crater of Iwo-dake on 18 January at 0830, 1030, 1640, and 1745. No air or ground shocks were felt by residents. Ash fell on the SE part of the island that evening. When observed from the air on 20 January, the white steam plume was a little larger than usual. A field party at the summit crater 26-28 January measured a fumarole temperature of 788°C, almost the same as in 1985. "Geologists visited Satsuma-Iwo-jima 7-10 November. Several large fumarole fields exist within and around the 300-m-diameter crater. Accessible fumaroles had temperatures ranging from 100 to > 800°C. Several types of sampling were conducted to geochemically characterize the emissions. GSJ geologists had used a COSPEC to measure a maximum SO2 flux of 500 t/d in May 1990, similar to . . . 15 years previously. In addition to geochemical samples, a portable spectrometer was used to collect spectra of various features to provide ground truth for satellite images of the region. The major summit geomorphological change since last year's visit by GSJ geologists was the formation of a 15 x 30 m pit crater in the SE corner of the main summit crater. Local silica-mine workers first noticed the new pit crater in June or July 1991. A large plume was continuously emitted from the pit crater." Information Contacts: R. Andres, Michigan Technological Univ; H. Shinohara, R. Symonds, and B. Ritchie, GSJ. During 25-27 April 1998 residents on Tokaro-Iwo-Jima Island reported minor ashfalls. A field inspection on 4-5 May by members of the Kagoshima Local Meteorological Office disclosed a 5-mm-deep ash deposit around the Iwodake Crater. This was interpreted to record a small-scale ash eruption. Around the time of the visit, earthquakes were at a level higher than usual. Several to 10 earthquakes per day were recorded during July 1998, similar to levels in March. During 27-29 July, reddish-brown ash clouds were escaping from the summit crater and light ashfalls were reported at the village of Takeshima, 10 km to the E of the summit. Seismicity was lower in August, with generally less than 10 events/day recorded. Several light ashfalls occurred during August. In September, earthquake activity increased to 20-40 events per day, and there were several minor ashfalls. Information Contacts: Yosihiro Sawada, Earthquake & Tsunami Observation Division, Seismology & Volcanology Dept., Japan Meteorological Agency, 1-3-4 Ote-machi, Chiyoda-ku, Tokyo 100-8122, Japan. The following summarizes activity at Satsuma-Iwo-jima (also called Tokara-Iwo-jima), an island on the NW rim of Kikai Caldera. Information concerning events in 1997-98 was provided through communications from Yosihiro Sawada, forwarded by Dan Shackelford. More recent information is available at the Japanese Meteorological Agency (JMA) website. JMA initiated seismic observation at Kikai in September 1997; from the beginning, several volcanic earthquakes were recorded each day. The number of earthquakes increased suddenly in April 1998 to 60-80/day with some days having more than 100 events. Earthquakes were at this high level during a field inspection on 4-5 May 1998. High numbers of earthquakes continued well into June, then gradually waned, before returning to levels seen in March (~10 events/day). Events decreased to <20/day by late June 1998, but increased again to 20-40/day during September, and to more than 60/day in late 1998. During the inspection in May 1998, JMA staff found a newly deposited ash layer 5 cm thick around the crater, suggesting that an eruption had occurred in late-April or early-May. The Geological Survey of Japan (GSJ) analyzed the ash and concluded that it was composed of silicic and altered lava fragments of Iwo-dake lava (rhyolite). 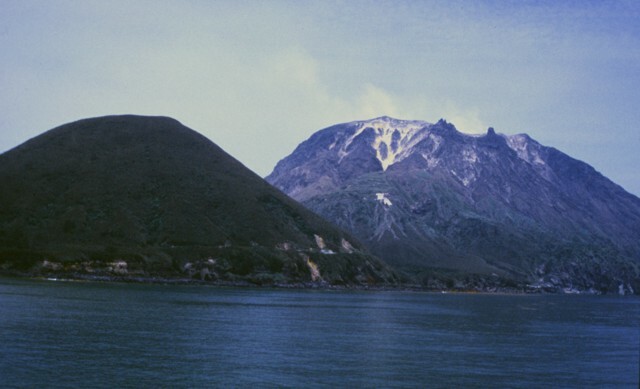 Residents of this volcanic island witnessed ash falls in August and October 1998. In early November GSJ scientists saw intermittent ash emissions from the crater and found ash deposits in the middle of the SE flank. Volcanic earthquakes occurred 50-100 times/day during January and February 1999, and 90-130 times/day after February. Hypocenters of these earthquakes were located just below Iwo-dake. Island residents observed ash falling on 24 January [and 14 February 1999]. Geophysical activity is monitored by the Sakura-jima Volcano Observatory, Kyoto University, and JMA; geochemical data are maintained by GSJ. Information Contacts: Yosihiro Sawada, Volcanological Division, Japan Meteorological Agency (JMA), 1-3-4 Ote-machi, Chiyoda-ku, Tokyo 100, Japan (URL: http://www.jma.go.jp/); Volcano Research Center, Earthquake Research Institute (ERI), University of Tokyo, Yayoi 1-1-1, Bunkyo-ku, Tokyo 113, Japan (URL: http://www.eri.u-tokyo.ac.jp/VRC/index_E.html); Dan Shackelford, 3124 E. Yorba Linda Blvd., Apt. H-33, Fullerton, CA 92831-2324 USA. This report covers activity through July 2001. Volcanic tremor was recorded during 20 to 23 July 2001. A seismometer about 700 m SW of Iwo-dake crater recorded 50-110 earthquakes daily, in comparison to 30-90 earthquakes recorded daily during December 2000 and March 2001. The Iwo-jima branch of the Mishima village office reported that ash fell during 19-21 July. A white plume rose to ~ 20 m above the crater. Faint ashfall and weak volcanic tremor had occurred since December 2000. Information Contacts: Volcano Research Center, Earthquake Research Institute, University of Tokyo, Yayoi 1-1-1, Bunkyo-ku, Tokyo 113-0032, Japan (URL: http://www.eri.u-tokyo.ac.jp/VRC/index_E.html). According to a Japanese Meteorological Agency (JMA) report on 6 June 2002, discolored plumes associated with volcanic tremor had intermittently issued from Kikai since 11 May 2002. The U.S. Air Force Weather Agency reported that plumes emanating from Satsuma-Iwo-jima (an island forming part of the NW caldera rim of Kikai) were visible on satellite imagery during 24-28 May and 1-4 June 2002. The thin plumes drifted to the S, SE, and E during May, and were estimated to be lower than 3 km altitude. Ash was seen from the island of Yaku-shima on the afternoon of 26 May. JMA noted that the number of small volcanic earthquakes increased after 29 May. The JMA report also stated that discolored plumes were observed from Mishima village in the Ryukyu Islands, and that ash fell on residential areas, during 3-5 June 2002. Information Contacts: Naokuni Uchida, Japan Meteorological Agency (JMA), Fukuoka, Japan (URL: http://www.jma.go.jp/); Volcano Research Center, Earthquake Research Institute, University of Tokyo, Yayoi 1-1-1, Bunkyo-ku, Tokyo 113-0032, Japan (URL: http://www.eri.u-tokyo.ac.jp/VRC/index_E.html); Charles Holliday, U.S. Air Force Weather Agency, 106 Peacekeeper Drive, Ste 2NE, Offut AFB, NE 68113-4039, USA (URL: http://www.557weatherwing.af.mil/). An eruption in 2002 began on 11 May when discolored plumes were noted (BGVN 28:04). Anomalous seismicity began on 14 May 2002, when about 900 events were recorded (table 1). The number of events dropped to very low levels the next day, but then gradually increased to a peak of 967 on the 28th and almost that many on the 29th. During June 2002, seismicity was high on the 2nd (650 events), 3rd (> 300 events), and 8th (~ 240 events). There were also 117 tremor events during the month, 73 of them on the 15th. Plumes and ashfall were reported through 5 June (BGVN 28:04). Table 1. Summary of seismicity and plume observations at Kikai, May 2002-January 2005. All reported plumes were described as either white (W), light white (LW), grayish white (GW), or gray (G). Data courtesy of JMA. Activity for the following year consisted of low-level seismicity of less than 200 events per month, and frequent, almost daily, white plumes. Eruptive activity began again on 7-8 June 2003 when 800-1,000 m ash plumes were recorded. Although plumes were not reported, eruptions also occurred during 10-12 June. Additional eruptions were noted by JMA during 7, 14-17, 26, 27, and 30 July, and 12, 13, and 15-18 August 2003. All of the June-August eruptions caused ashfall. The last grayish white eruption plumes in 2003 were seen on 19 and 22 September. From March to September 2004, Tokyo Volcanic Ash Advisory Center (VAAC) reports indicated a number of small eruptions at Kikai. Three plumes in March 2004 reportedly rose to 1.5 km altitude, but no ash was visible in satellite imagery (table 2). JMA also reported eruptions on those days, but only indicated plumes 700 m high. Table 2. Date and time of eruptions from Kikai, the direction and altitude of observed plumes, and whether ash was seen on satellite image. Based on information from the Tokyo VAAC. Another plume on 1 June did have ash visible to satellites. This eruption was not included in the JMA observations. Plumes were seen again on 13 August and 25 September, again with JMA only reporting 700-800 m plumes compared to 1.2 and 1.5 km plumes, respectively, in the VAAC advisory. No seismicity was detected during 25 September-5 October 2004, the period following the eruption of a grayish-white plume to 700 m. Data from JMA through January 2005 indicate continuing volcanic earthquakes (less than 10/day in December) and almost daily white plumes as high as 700 m, but generally 400 m or below. Information Contacts: Japan Meteorological Agency (JMA), Volcanological Division 1-3-4 Ote-machi, Chiyoda-ku, Tokyo 100, Japan (URL: http://www.jma.go.jp/); Tokyo Volcanic Ash Advisory Center, Japan Meteorological Agency (JMA), 1-3-4 Ote-machi, Chiyoda-ku, Tokyo 100, Japan (URL: https://ds.data.jma.go.jp/svd/vaac/data/). Kikai was the scene of ongoing steaming and modest seismic unrest during October 2010-June 2012. As background, Kikai (also called Satsuma-Iwo-jima and Tokara-Iwo-jima), an island on the NW rim of the submerged Kikai caldera (figure 1), experienced chiefly low-level seismicity between 2002 and 2004 punctuated by stronger earthquakes and tremor, and three small eruptions during May-June 2002, June-August 2003, and March-September 2004 (BGVN 28:04 and 30:07). Almost daily plumes, most of which were white, occurred between late 2002 and at least January 2005 (BGVN 30:07). Figure 1. Maps showing Kikai caldera and the two associated islands along its rim, Satsuma-Iwo-jima and Tokara-Iwo-jima. The top-right inset map shows the regional extent of the main figure; the lower-left inset map (b) relates to the author's proposed model of pyroclastic flow venting and tsunami generation. Taken from Maeno and Imamura (2007). Recent monthly reports of volcanic activity from the Japan Meteorological Agency (JMA) translated into English resumed in October 2010. Thus, in this report, we lack JMA reports between January 2005 and September 2010 and only summarize and tabulate activity after October 2010 and as late as June 2012. In an effort to gather other information, we searched for MODVOLC thermal alerts at Kikai and found none during January 2005 to late September 2012. Only one alert appeared in the past decade. That weak alert occurred on 2 August 2003 at a point along the coast well to the NE of the crater. This was unlikely the result of eruptive causes owing to the location and extended absence of alerts at the crater and dome. Near-source thermal photography (noted by JMA and mentioned below) revealed subtle thermal anomalies suggesting elevated temperatures over parts of the dome. According to JMA, seismicity was relatively low during October 2010-June 2012. Slight increases occurred during 28-31 October 2010 and on 21 August 2011 (Table 3). White-plumes appeared at Iodake summit crater, and their size remained above background throughout the reporting period (Table 3). An occasional night-time glow was visible with a high-sensitivity camera, during at least January-April 2011, July-August 2011, February 2012, and May-June 2012. Table 3. Monthly summary of seismicity and plume observations at Kikai during October 2010-June 2012. All reported plumes were described as white. All reported volcanic tremor was of small amplitude and short duration. Seismicity in October 2010 was low (as shown) except for occasional increases on 28, 30 and 31 October. The tremor during February 2011 was the first to occur since February 2010. '-' indicates data not reported. Data courtesy of JMA. Aerial infrared observations on 14 December 2010 and during November-December 2011 found that the distribution of thermal anomalies in the crater had not changed since previous observations in April 2008 and on 22 December 2009. In addition, according to the Japanese Coast Guard, the summit crater did not visibly change between observations on 22 October 2010 and 19 January 2011. According to a field survey on 26 November 2011, the sulfur-dioxide flux averaged 800 tons per day. In December 2011, discolored water, apparently caused by volcanic activity, was observed near the coast. No remarkable crustal change was observed by GPS during Janurary 2012-June 2012. The journal Earth, Planets and Space produced an edition in 2002 with 16 articles devoted to Kikai caldera, Satsuma-Iwo-jima, and related topics (Shinohara and others, 2002). A video entitled "Satsuma-Iwojima, Japan" uploaded to Youtube in September 2008 shows a steaming fumarole with bright yellow (sulfur?) incrustations (str4hler, 2008). References. Maeno, F. and Imamura, F., 2007, Numerical investigations of tsunamis generated by pyroclastic flows from the Kikai caldera, Japan, Geophysical Research Letters, Vol. 34, L23303 (DOI: 10.1029/2007GL031222). Shinohara, H., Iguchi, M., Hedenquist, J.W., and Koyaguchi, T., 2002, Preface to special volume, Earth, Planets and Space, Vol. 54 (No. 3), pp. 173-174.
str4hler, 2008, [Video] Satsuma-Iwojima, Japan. Accessed 21 September 2012, uploaded to Youtube on 16 September 2008 (URL: http://www.youtube.com/watch?v=jyIhaEQAPlw). Information Contacts: Japan Meteorological Agency (JMA), Otemachi, 1-3-4, Chiyoda-ku Tokyo 100-8122, Japan (URL: http://www.jma.go.jp/); MODVOLC, Hawai’i Institute of Geophysics and Planetology (HIGP), MODVOLC Thermal Alerts System, School of Ocean and Earth Science and Technology (SOEST), Univ. of Hawai’i, 2525 Correa Road, Honolulu, HI 96822, USA (URL: http://modis.higp.hawaii.edu/). Kikai is a 17 x 20 km mostly submarine caldera as close as ~40 km from the S margin of the island of Kyushu (see figure 1 in BGVN 37:07; also see Shinohara and others, 2002, for 16 journal articles devoted to this volcano. Maeno, 2008, offers an online overview). A few areas on the caldera rim lie above water (figure 2). Mild-to-moderate emissions have often occurred at the dome called Iwo-dake (alternately spelled Iodake, figure 2). Table 4 summarizes the seismicity and steam plume observations for July-December 2012, an interval of calm, absence of tremor, and low hazard status. Figure 2. A shaded-relief, contour map of Kikai caldera that labels three islands on the N caldera rim, Satsuma Iwo-jima, Showa Iwo-jima, and Take-shima. Satsuma Iwo-jima contains the highest point of the complex (704 m elevation). On that island, the cones Iwo-dake (a rhyolitic volcano) and Inamura-dake (a basaltic volcano) both reflect post-caldera volcanism focused along or just inside the caldera's wall (the shaded, scalloped line trending NE across the island). The island Showa Iwo-jima emerged during the caldera's last major eruptions, during 1934-1935, starting with floating pumices and including late-stage lava emissions that helped armor the island and allowed it to erode only modestly during the subsequent decades of breaking waves. The caldera floor chiefly resides 300-500 m below sea level but it also contains some post-eruptive cones. From Fukashi Maeno (2008). Table 4. Monthly summary of seismicity and plume observations at Kikai during July-December 2012. All reported plumes were described as white. Data courtesy of JMA. We last reported on Kikai activity through mid-2012 (BGVN 37:07) covering generally small steam plumes and monthly seismicity of up to ~200 earthquakes per month through June 2012. This report is a compilation of subsequent monthly reports of volcanic activity through December 2012 from Japan Meteorological Agency (JMA) monthly reports. The Alert Level remained constant at Level 2 (on a scale of 1-5: 2 = "Do not approach the crater"), before being downgraded to Level 1 in December 2012. Between July and September 2012, plume emissions at the Iwo-dake summit crater continued (table 4). Weak incandescence was recorded at night with a high-sensitivity camera on 22 July, 28 August, 6 November and 22-24 November. Seismic activity remained at low levels. No unusual ground deformation was observed in GPS data through December 2012. An aerial observation conducted by the Japan Maritime Self-Defense Force (JMSDF) on 11 September 2012 revealed white plumes rising from Iwo-dake's summit crater and flanks. The results of a field survey conducted from 17-20 November 2012 showed no remarkable change in white fumes from Iwo-dake. Infrared images also found that the temperature distribution had remained essentially unchanged. Aerial monitoring conducted by the Japan Coast Guard (JCG) on 25 November 2012 revealed the presence of brown and green discolored water around the eastern coast (similar findings as a previous survey) as well as patterns of steaming similar to those observed during the field survey. SO2 emissions during 17-20 November 2012 were measured to be ~400 tons/day; a previous survey conducted in July 2012 yielded an estimated flux of ~500 tons/day. References. Shinohara, H., Iguchi, M., Hedenquist, J.W., and Koyaguchi, T., 2002, Preface to special volume, Earth, Planets and Space 54 (3), pp. 173-174. Maeno, F, 2008, Geology and eruptive history of Kikai Caldera, Earthquake Research Institute, University of Tokyo (URL: http://www.eri.u-tokyo.ac.jp/fmaeno/kikai/kikaicaldera.html); accessed 23 February 2013. Information Contacts: Japan Meteorological Agency (JMA), Otemachi, 1-3-4, Chiyoda-ku Tokyo 100-8122, Japan (URL: http://www.jma.go.jp/); MODVOLC, Hawai'i Institute of Geophysics and Planetology (HIGP), MODVOLC Thermal Alerts System, School of Ocean and Earth Science and Technology (SOEST), Univ. of Hawai'i, 2525 Correa Road, Honolulu, HI 96822, USA (URL: http://modis.higp.hawaii.edu/). Kikai is a caldera, mostly submerged, which includes several islands (figure 1). Previous reports documented modest seismic activity during October 2010-December 2012, with occasional tremor (through June 2012), minor earthquakes, and diffuse white plumes (BGVN 37:07 and 38:01). Subsequent activity during January 2013-July 2014 included one eruption with intermittent explosions, occasional ash and steam plumes, and sporadic weak seismic tremor. Figure 1. The subaerial expression of Kikai includes two major islands: Satsuma Iwo-jima (~5.5 km long) and Take-shima (~4.5 km long). Three additional islands are included in the structure: Unose, Asase, and Showa Iwo-jima, of which only Showa Iwo-jima was large enough to include on this topographic map. The red dotted lines correspond to the mostly-submerged Kikai caldera structure. Elevations and bathymetry are indicated by color coding based on the key in meters. Courtesy of the Geological Survey of Japan. Ash plume on 4 June 2013. During 2013, seismicity from Satsuma Iwo-jima was at background levels and plume activity (vapor plumes that rose 300-900 m above the summit) was limited for most of the year (figure 2). Seismic unrest occurred during 15-26 May but dropped back to normal levels thereafter. Figure 2. Plots showing multi-year records of measured plume heights (1 and 3) and volcanic earthquakes (2 and 4) during 1 January 1998-3 June 2013 from Satsuma Iwo-jima. Explosive events frequently occurred during 1998-2004 (red arrows) and following a ~8 year hiatus, activity resumed on 3 June 2013. Plume heights are measured in meters above the crater. Note that 1) personnel began observational monitoring on 1 August 1998; 2) video monitoring was installed on 16 November 2002; 3) there were video camera problem during 23 February-21 March 2009; 4) seismic data is incomplete due to problems with monitoring equipment. This record is from a seismic station located less than 1 km from the summit. Courtesy of Japan Meteorological Agency (JMA). According to the Japan Meteorological Agency (JMA), weak tremor was detected at 0502 on 4 June. At ~0517, an eruption began, with explosions occurring intermittently until 1500. An ash plume drifted W from Satsuma Iwo-jima's summit (figure 3), Iodake (also "Iwo-dake"). As a result, JMA raised the Alert Level from 1 to 2 on a scale of 5. The Tokyo Volcanic Ash Advisory Center (VAAC) issued two advisories on 4 June, although no ash was visible in satellite images. Despite this activity, there were few signs of unrest from the seismic, GPS, and thermal monitoring networks during 3-5 June. JMA released a warning about potentially hazardous conditions within 1 km of the summit and noted that the leeward side of the island could experience ashfall and gas emissions. Figure 3. Areas at Satsuma Iwo-jima on 4 June 2013 with observed an ash plume (yellow circles) and potential ashfall (white circles). Low-level clouds obscured much of the view, but brown-colored areas in the white clouds were identified as ash. The town of Mishima is located at the cluster of white buildings in the harbor (Nagahama Bay) formed by the Erabuzaki peninsula. Within the harbor and other protected inlets along shore, the water color is orange-brown; this is a persistent feature of the island that results from hydrothermal vents contributing Fe-oxyhydroxides and causing turbidity (Kiyokawa and others, 2012). The look direction in both images is approximately NNW. Courtesy of JMA. Ashfall from the 4 June 2013 eruption was reported on the flanks of Iodake during field surveys. Deposits were also noted in the village of Mishima, ~3 km WSW of the summit. After 6 June, white plumes rose from the summit as high as 400 m. Sulfur dioxide emissions measured before and after the eruption did not indicate any anomalies; the average flux was 300 tons per day based on measurements from 29 May and 400 tons per day on 9 July 2013. Aerial surveys and thermal monitoring. Hot springs and other thermal feature have been well-documented and monitored across Satsuma Iwo-jima (figure 4). JMA reported that an aerial survey on 13 June 2013 provided a view of the E flank where a persistently active fumarole appeared to have expanded in size (figure 5). Aerial surveys conducted on 9 July and 25 December 2013 found no major thermal changes on the surface of Iodake; however, elevated temperatures persisted at fumarolic sites (figure 6). Figure 4. (A) Geologic map of Satsuma Iwo-jima annotated with place names and showing the small islands of Unose (NE), Showa Iwo-jima (NE), and Asase (SE). Lithologies range from rhyolite to basalt; Iodake (also written Iwodake) is dominantly rhyolitic (the Nagahama lava flow is dacitic), Yahazudake is andesitic-to-basaltic, Showa Iwo-jima has a rhyolitic central zone and dacitic breccia zone, and Inamura-dake is basaltic (Maeno and Taniguchi, 2006; Ono and others, 1982). (B) Distribution of fumaroles, hot springs, and diffuse soil gas emissions on Satsuma Iwo-jima and offshore sites. The highest temperatures (~800°C) were mainly restricted to the summit of Iodake, within Oana crater. The black arrow indicates the area where a low-temperature (~100°C) fumarole has been active on the E flank, the location of morphological changes in June 2013. Courtesy of the Geological Survey of Japan. Figure 5. Aerial survey recording conditions on Satsuma Iwo-jima on 13 June 2013. The scar associated with an active fumarole on the E flank (red circle) was notably larger compared to previous images from December 2012. Courtesy of JMA. Figure 6. Thermal images (at right) paired with visible light photos of Satsuma Iwo-jima from less than 2 km away taken on 9 July 2013. Visible and thermal images of the N (top) and W flank (bottom). JMA noted that elevated temperatures from the ground surface occurred in areas known for fumarolic activity. These conditions did not change significantly in the months before or after the 4 June 2013 eruption. Courtesy of JMA. Observations during 2014. JMA reported few changes during January-July 2014 (table 1). White plumes were frequently observed and typically rose 300-800 m above the summit (figure 7). Earthquakes occurred at background levels. Four episodes of tremor occurred in February with a total duration of two minutes. Several field surveys determined that no significant changes were occurring with respect to SO2 flux and thermal emissions. Since December 2013, incandescence from the summit was observed only in January and June 2014. Table 1.Monthly observations and monitoring data for Satsuma Iwo-jima during December 2013-July 2014. Plume heights were documented and presumably reflect characteristic heights seen above the vent; white plumes were frequently visible. Courtesy of JMA. Dec 2013 400 m 122 Incandescence. Jan 2014 500 m 153 Incandescence; sulfurous plume visible. Feb 2014 400 m 180 Four episodes of tremor (2 minutes). Mar 2014 400 m 173 SO2 flux 700 tons/day. Jun 2014 300 m 172 Incandescence; thermal surveys showed no changes to surface temperatures. Figure 7. Video camera image of Satsuma Iwo-jima at 1500 on 6 January 2014. Steam plumes such as this were frequently observed during January-July 2014 rising 300-800 m above the crater. The camera location was ~3 km W of the summit near the town of Mishima. Courtesy of JMA. References. Kiyokawa, S., Ninomiya, T., Nagata, T., Oguri, K., Ito, T., Ikehara, M., and Yamaguchi, K.E., 2012, Effects of tides and weather on sedimentation of iron-oxyhydroxides in a shallow-marine hydrothermal environment at Nagahama Bay, Satsuma Iwo-Jima Island, Kagoshima, southwest Japan, Island Arc, 21, 66-78. Maeno, F. and Taniguchi, H., 2006, Silicic lava dome growth in the 1934–1935 Showa Iwo-jima eruption, Kikai caldera, south of Kyushu, Japan, Bulletin of Volcanology, 68, 673-688. Ono, K., Soya, T., and Hosono, T., 1982, Geology of the Satsuma-Io-Jima District. Quadrangle Series, Scale 1:50,000, Geological Survey Japan, 80 p.
Information Contacts: Japan Meteorological Agency (JMA), Otemachi, 1-3-4, Chiyoda-ku Tokyo 100-8122, Japan (URL: http://www.jma.go.jp/); Geological Survey of Japan and National Institute of Advanced Industrial Science and Technology (GSJ, AIST) (URL: https://www.gsj.jp/en/index.html, http://www.aist.go.jp/index_en.html); Tokyo Volcanic Ash Advisory Center (VAAC), Tokyo, Japan (URL: http://ds.data.jma.go.jp/svd/vaac/data/). Kikai is a mostly submerged, 19-km-wide caldera near the northern end of the Ryukyu Islands south of Kyushu. Kikai was the source of one of the world's largest Holocene eruptions about 6300 years ago. Rhyolitic pyroclastic flows traveled across the sea for a total distance of 100 km to southern Kyushu, and ashfall reached the northern Japanese island of Hokkaido. The eruption devastated southern and central Kyushu, which remained uninhabited for several centuries. Post-caldera eruptions formed Iodake lava dome and Inamuradake scoria cone, as well as submarine lava domes. Historical eruptions have occurred in the 20th century at or near Satsuma-Iojima (also known as Tokara-Iojima), a small 3 x 6 km island forming part of the NW caldera rim. Showa-Iojima lava dome (also known as Iojima-Shinto), a small island 2 km east of Tokara-Iojima, was formed during submarine eruptions in 1934 and 1935. Mild-to-moderate explosive eruptions have occurred during the past few decades from Iodake, a rhyolitic lava dome at the eastern end of Tokara-Iojima. Hedenquist J W, Aoki M, Shinohara H, 1994. Flux of volatiles and ore-forming metals from the magmatic-hydrothermal system of Satsuma Iwojima volcano. Geology, 22: 585-588. Machida H, 1990. Frequency and magnitude of catastrophic explosive volcanism in the Japan region during the past 130 ka: implications for human occupance of volcanic regions. Geol Soc Aust Symp Proc, 1: 27-36. Machida H, Arai F, 1981. Late Quaternary large eruptions recorded in distal areas around Japan. IAVCEI Tokyo Mtg Abs, p 214-215. Maeno F, Taniguchi H, 2006. Silicic lava dome growth in the 1934-1935 Showa Iwo-jima eruption, Kikai caldera, south of Kyushu, Japan. Bull Volcanol, 68: 673-688. Maeno F, Taniguchi H, 2005. Eruptive history of Satsuma Iwo-jima Island, Kikai caldera, after a 6.5 ka caldera-forming eruption. Bull Volc Soc Japan (Kazan), 50: 71-85 (in Japanese with English abs). Maeno F, Taniguchi H, 2007. Spatiotemporal evolution of a marine caldera-forming eruption, generating a low-aspect ratio pyroclastic flow, 7.3 ka, Kikai caldera, Japan: implication from near-vent eruptive deposits. J. Volcanol. Geotherm. Res., 167: 212-238. Matsushima N, Kazahaya K, Saito G, Shinohara H, 2003. Mass and heat flux of volcanic gas discharging from the summit crater of Iwodake volcano, Satsuma-Iwojima, Japan, during 1996-1999. J. Volcanol. Geotherm. Res., 126: 285-301. Ono K, Soya T, Hosono T, 1982. Geology of the Satsuma-Io-Jima district. Geol Surv Japan, 1:50,000 geol map and text (in Japanese). Saito G, Kazahaya K, Shinohara H, Stimac J, Kawanabe Y, 2001. Variation of volatile concentration in a magma system of Satsuma-Iwojima volcano deduced from melt inclusion analyses. J. Volcanol. Geotherm. Res., 108: 11-31. Ui T, Kobayashi T, 1988. Catastrophic pyroclastic flow eruption at Kikai caldera, 6300 years ago. Kagoshima Internatl Conf Volc Abs, p 396. There is no Deformation History data available for Kikai. There is no Emissions History data available for Kikai. Kikai is a mostly submerged, 19-km-wide caldera south of Kyushu that was the source of one of the world's largest Holocene eruptions about 6300 years ago. Pyroclastic flows traveled across the sea for a total distance of 100 km and devastated southern and central Kyushu. This view from near the summit of the post-caldera cone Iwo-dake shows the western rim of Kikai caldera forming the peninsula (upper left) behind conical Inamura-dake scoria cone. Photo by Yasuo Miyabuchi, 1996 (Forestry and Forest Products Research Institute, Kyushu). 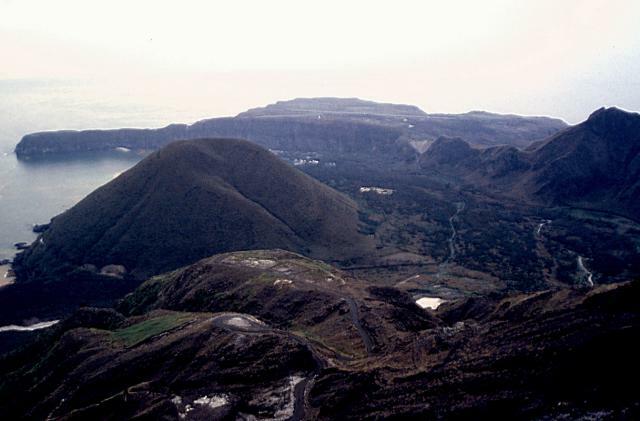 Satsuma-Iwo-jima, seen here from the SW, is a complex post-caldera island constructed on the NW margin of Kikai caldera. Iwo-dake (Io-dake) on the right is a lava dome composed of thick rhyolitic lava flows. Rounded Inamura-dake (left) is a scoria cone. Shallow submarine eruptions have also occurred following the formation of the caldera about 6300 years ago. Large Eruptions of Kikai Information about large Quaternary eruptions (VEI >= 4) is cataloged in the Large Magnitude Explosive Volcanic Eruptions (LaMEVE) database of the Volcano Global Risk Identification and Analysis Project (VOGRIPA).